Incredible 61 track digital collection of volumes 1 and 2 - on digital for the first time! This week Manchester University announced that it is in possession of over 250 reels of lost Delia Derbyshire tapes. So far they've ony released a handful of snippets, but among them is a track from the late 60s that seems to prove that the girl invented Techno 40 years ago - with a cluster of blips and rhythms that would make Aphex Twin blush. It was further proof, if it were needed, of the legacy and importance of the BBC Radiophonic workshop, the collection of innovative souls who continue to define British electronic music to this day. 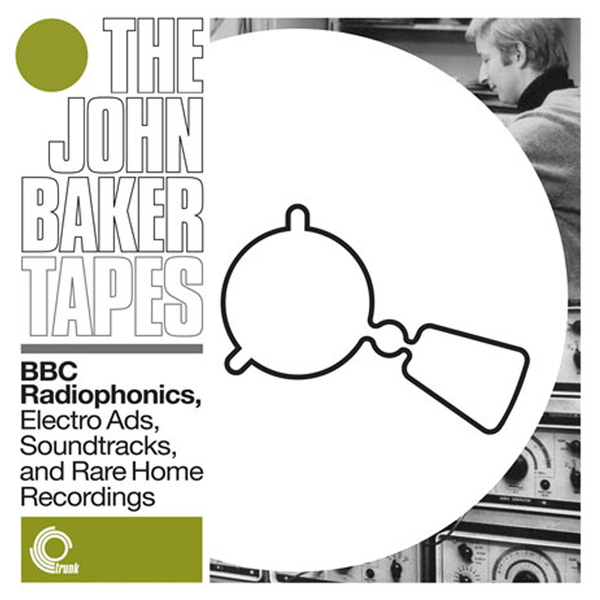 John Baker was at the Radiophonic Workshop from the beginning and was one of the core three composers who conceived the sounds we came to know and love. Baker's work on Doctor Who is probably best known, but this forty-nine track disc of previously unreleased material delves deep into his career and has been painstakingly put together by people that truly love his work. Alan Gubby was contacted by Baker's brother who had discovered over thirty reels of tape, and on hearing that they were likely to end up in a skip Gubby spent a year fixing them up, digitising them and preparing them for release. Sooner or later he realised that the task was a little too much for him to handle solo, so musical superhero Jonny Trunk was called in and the rest, as they say, is history. Co-incidentally the disc has hit on the fiftieth anniversary of the Radiophonic Workshop, so it is a fitting celebration and has been lovingly handled by Trunk as usual with extensive liner notes and gorgeous artwork. The techniques pioneered by these musicians are just astonishing. On 'Womans Hour' we can hear Baker going into his sound process as if it were something anyone could do, talking through the creation of rhythms from slowing down and chopping up the sound of cider being poured out of a bottle. This use of sound crops up again and again as Baker takes absolutely any sound available to him and uses his extensive musical training (he was a well respected jazz player) to re-frame these sounds as musical compositions. Where Derbyshire's music often focused on the character of the sound itself, Baker had no problem in revealing his classically-trained roots and the hooks and catchiness of his jingles and themes are comparable to American early-electronic pioneer Raymond Scott. Subtle stabs and pre-synthesizer hiccups are crafted lovingly into wordless nursery rhymes with the greatest of ease. Volume 2 collects the Radiophonic Workshop maestro's soundtrack work, covering films, TV music and advertising jingles. Even prior to the release of that first, essential volume of this two-part career overview, anyone familiar with the Radiophonic material already in circulation will have been aware of Baker's brilliant sound designs on TV music like 'Factors' and 'Structures' - he's probably one of the more widely recognized contributors to the Workshop's sound during its golden age, from the early '60s to early '70s, but this volume from Trunk sheds so much more light on Baker's formidable talents. We probably already knew him as the master of jingles, stings and TV/radio idents but this collection pulls together yet more evidence of his innovation and all-round mastery - and that isn't restricted to the meticulous tape edits and electronic wizardry for which he's best known. This compilation also goes someway toward revealing Baker's relationship with jazz and more formal composition; Baker had studied piano and honed his craft as a writer at the Royal Academy Of Music, and you can certainly hear where that training paid off on these recordings. His knack for difficult rhythms and intricate editing comes to the fore on impeccably timed tape collages like the collection of 'Electro' library pieces. Further to that, Baker's more conventional compositional technique shines through on a number of jazzy piano works ('Get Happy', for example) while his score for 'Boy On A Bicycle' (Ridley Scott's first motion picture, no less) is arranged for a full band, comprising a brass ensemble. Making a connection between these conventional instrumental excursions and Baker's more abstract material, 'Piano Strokes' and 'Piano Concrete MQ LP48/5' might be seen as precursors to the kind of electronic piano treatments that were all the rage a couple of years back in the microsound community, pulling apart the natural timbres of the instrument via tape manipulation. As the album draws to a close, we're treated to Baker's radio obituary, as broadcast by the BBC on Brief Lives in 1997, which includes recorded snippets of the man himself talking us through examples of his work. Finally, Baker's first ever recording - a piano rendition of 'All The Things You Are', originally pressed up on 78rpm vinyl concludes this superlative set on an especially poignant note, completing a fine tribute to a remarkable career. As unnecessary as it probably is to make such a statement, anyone with even the remotest interest in tape music or the Radiophonic Workshop should consider this an indispensable document of one of Britain's very greatest sound designers at work. Immense.